James Ryan walks through the American Cemetery in Normandy, an old man. He stops at a headstone, and falls to his knees, tears in his eyes. The headstone reads: John Miller. As Ryan’s wife comes to his side, he says through his tears, “Have I been a good man? Tell me I’ve lived a good life.” Moved, his wife assures Ryan that he has. Yet the tears don’t abate. James Ryan can’t be sure if he’s been good enough. In Saving Private Ryan, Steven Spielberg marshals a wonderful ensemble cast to tell a wonderfully scripted, beautifully shot, movingly acted, and soul-crushingly judgmental story. John Miller is tasked with taking a squad of 8 men to find just one. Private James Ryan is the fourth son of a woman who has lost the other three in World War II. It has been decided that she will not lose a fourth. Miller’s squad eventually loses every man in the effort to save Private Ryan. Miller meets his own end defending a bridge by Ryan’s side. 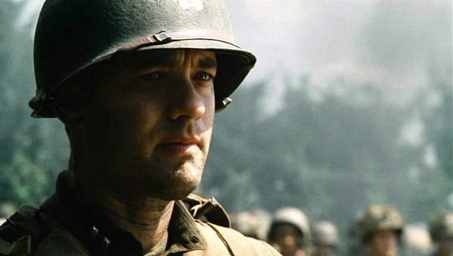 With his last breath, he looks at Private Ryan and whispers, “Earn this.” With these words, he dies. We flash sixty years into the future, and the octogenarian Ryan has clearly lived his entire life with this great weight on his shoulders. Has he indeed earned the salvation that Miller’s squad gave their lives for? Miller himself, earlier in the film, muses, “He better be worth it. He’d better go home and cure a disease, or invent a longer-lasting light bulb.” Has he discovered a cure for malaria? Has he invented cold fusion? That awesome upside-down ketchup bottle? As viewers, we aren’t given to know. What we do know, however, is that he’s worried. Why else does he beseech his wife to comfort him? We see that he has a beautiful family. His wife tells him he has been a good man. Clearly, leading a good life has not freed him from the judgment of Miller’s words. Christians too often hear these words, “Earn this,” coming from Jesus’ lips as he dies on the cross. We hear sermons to this effect: “Is the life you’re living worth the death he died?” We live our lives trying to earn it, to become someone for whom such a sacrifice isn’t so radically inappropriate. 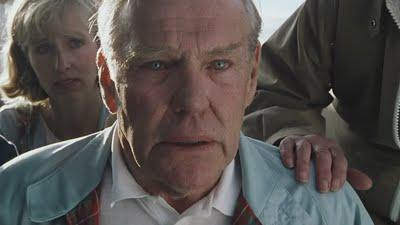 We turn into old James Ryans, worried that it hasn’t been quite enough. The most shocking revelation of the film is that Ryan’s wife has no idea who John Miller is! Miller’s judgment has been so heavy that Ryan has not been able to share his name or story with his beloved for his whole life! But Jesus doesn’t say, “Earn this” from the cross. He says, “It is finished.” Even more radically, he says, “I tell the truth, today you will be with me in paradise.” The message of the Gospel is diametrically opposed to John Miller’s “Earn this.” Miller applies the law to Ryan’s future in a way that Ryan can never escape. No matter how profound an altruist Ryan may become, the profundity of Miller’s sacrifice will never allow Ryan to feel satisfied, or safe from Miller’s judgment-from-beyond-the-grave. One word of law destroys the grace Miller shows in sacrificing his life for Ryan. But it is not so with Christ.